The curtsy lunges exercise is the second warmup exercises in the Exercise for Better Bones program. You should do this exercise before you start your Strength exercises and remember to enjoy this, think positive thoughts and use the opportunity to get your training off to a great start. Below I demonstrate the two versions of the curtsy lunges — one for the Beginner level and the other for the Active level. Enjoy! Instructions for the curtsy lunges beginner level. 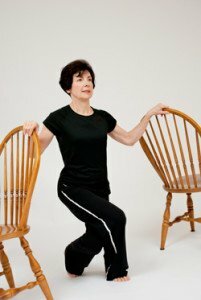 With the curtsy lunges beginner level, always have your hands over two sturdy chairs. You want the chairs far enough that your arms are almost fully outstretched. That’s going to give you a little more stability as you go into your curtsey lunges beginner until you learn to do it with a little better balance. I’m stepping inside two squares and near the front corners of these squares. These squares that I’ve drawn are 18 inches by 18 inches. Based on my leg length, that works well for me. It’s to give you a sense, you don’t have to draw the squares yourself, but to give you a sense of where to step. With my curtsy lunges beginner, I’m going to place my foot in the opposite back corner of the square, and I’m going to come down with my knee dropping inside my calf. Come back, step across into the back of the square, down, and back to the center. The curtsy lunge is a move that’s used a lot in Tai Chi. It is also in athletics used, but referred to as a drop lunge. We’re going to start at the active level with the hands together. Good weight bearing through your feet, down through your spine. What I’ve done is drawn two squares beneath me, 18 inches by 18 inches, so they’re 18 inches long by 18 inches wide. Start in the center of the square. Go back into my drop lunge or my curtsy lunges. Using my hands to counterbalance, I’m stepping towards the outside corner of the square. Then come back, and with the return, the opposite side, stepping towards the outside top corner of the square. You don’t have to draw squares for yourself, but it’s a good starter to give you a sense of where your foot ends up going. A point here is to remember that your foot, when placed back into the corner the heel stays up, and your weight bearing through the ball of your foot. And back in and then, weight bearing to the ball of your foot, back. And your knee slides inside the calf, and that’s your active level warm up with curtsy lunges. My comment is more of a question. As well as balance exercises, I stretch, but I still can’t put my pantyhose on! I even have difficulty putting socks on. I stretch my hamstrings every morning. What could be the problem?